We offer many different varieties of water aerobics. If you want to have a water workout experience while getting to know many of our members in your class, water aerobics is perfect for you! Some of our classes include Aqua Zumba, Senior Workout and Arthritis Aquatics. Click HERE for a current group exercise schedule or Active Older Adults schedule. 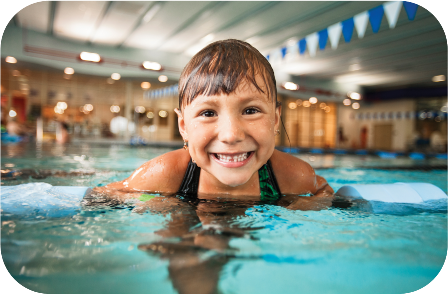 The YMCA reserves the right to swim test all children under the age of 16 in order to prevent drownings and accidents. We strictly enforce this policy to ensure the safety of the children who use our pools. The YMCA offers an extensive learn-to-swim program for all ages. Whether you are a non-swimmer or looking for advanced techniques, the YMCA has a program for you. Learn about all of your swim lesson options with our Aquatics Program Brochure or the links below. Goals: Infants and toddlers learn to be comfortable in the water and develop swim readiness skills through fun and confidence building experiences, while parents learn about water safety, drowning prevention, and the importance of supervision. Parent/Guardian must accompany child in the water. Children must wear a bathing suit and swim diaper. Goals: Pre-schoolers will learn personal water safety and achieve basic swimming competency. Stroke Mechanics – refines stroke technique on all major competitive strokes and encourages swimming as a part of a healthy lifestyle. Goals: School age swimmers will learn waters safety skills, build stroke technique and endurance, while developing skills that will increase social-emotional and cognitive well-being. Stoke Mechanics – refines stroke technique on all major competitive strokes and encourages swimming as a part of a healthy lifestyle. Goals: Through group drills and individual attention, we instruct new and apprehensive swimmers as well as those looking to correct their strokes. Teen age and adult swimmers will learn water movement and stroke technique, while developing skills that prevent chronic disease, and foster a lifetime of physical activity. If you are wondering what group your swimmer fall into, use our lessons selector. The Sumter YMCA Swordfish gives everyone a great opportunity to achieve his or her potential! Our mission is to provide a safe environment where children can learn, improve, and enjoy the sport of swimming. On our year-round swim team, every member has a place and every swimmer is important to our success! We offer multiple competitive and developmental groups for swimmers ages 5-21. Swimmers gain experience through YMCA and USA Swimming competitions. Many members enjoy our family and team-first atmosphere, which is easy to see at meets, social events and team practices. Swim team quarterly fees are based on skill level and membership. Please e-mail Head Coach Igor Iovanovich to join. Our swimming lessons for children for special needs is a great way to serve children with any special need. We know that not every child learns the same way, so we’re patient and understanding with ALL of our swimmers. Swimming is an ideal activity for kids, especially those with special needs, because it can also showcase hidden abilities and talents. We focus on positivity and celebrate accomplishments big and small! View our current class offerings by downloading the flyer. Contact our Aquatics Director with questions about this program. Whether you want to swim laps on your own or do your own fitness workout in the pool, we have special times set aside for these activities. Please check our current schedules HERE for the Warm Water Deck Pool and the Austin Francis Cool Water Pool. Lap Swimming Tips: Please enter the pool from the shallow end. To avoid accidents, when entering an occupied lane, please get the first swimmer’s acknowledgment that you are there. Directions for Adult Lap: If there are 1 or 2 swimmers in a lane, they may elect to split the lane in half. The entrance of a third person immediately changes the lane to “circle” swimming format. Speed: Please choose a lane with swimmers that most nearly match your speed. During this unstructured swim time, families can enjoy our facility. Flotation aids other than U. S. Coast Guard approved life vests are not permitted at any time. See our current pool schedules HERE.